Issue #112 of the of The Flash is another one of those issues that I didn’t come across until much later after I had already discovered The Flash. I always wonder how different my life might have been if #112 or any of the preceding issues had been my first. Your first is always kind of special. Would I later have loved #115 (my actual first) quite as much? With that head start, would I have been the one to submit ideas to DC, be offered a job there, only to later move on to Marvel and end up still later in life editing a fun and informative magazine called Alter Ego? Hard to say really. You never know how different the ripples in the space time continuum might have been. And different they surely would have been because issue #112 is another killer. What an amazing creative ride Julie Schwartz, John Broome, Carmine Infantino, Joe Giella and Murphy Anderson were on during this period. On the cover, it looks they’ve come up with a cool new super villain, the Elongated Man, only to have author Broome, after leading us all on for the entire story, flip it on its head at the end to say: “Fooled you… I’ve actually created a new super hero!” It was a clever turn and certainly nothing I’d ever experienced in my thirteen long years on the planet. Super heroes had kid partners, but not many of them had a real buddy. 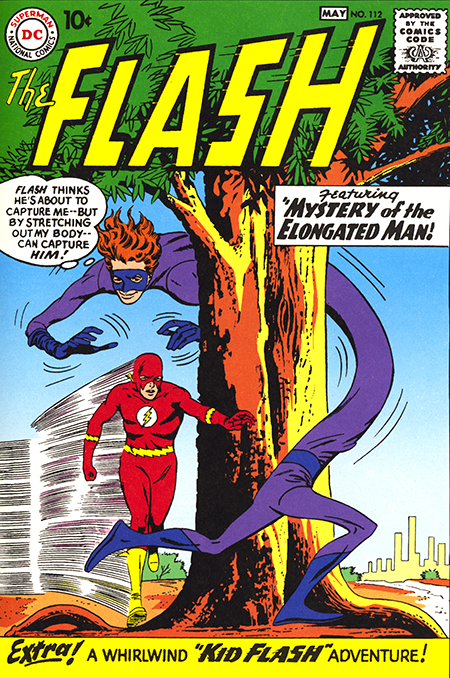 Fun fact: in the story, Ralph Dibny, the Elongated Man, gets his stretching powers from a special extract that came from the fruit of the Gingo tree. When we built our house, I planted a ginkgo tree (I figure Broome probably just misspelled it) in honor of the Elongated man’s power source. Still waiting for the fruit, but when I get I finally get some… look out! The second story is a Kid Flash piece called Danger on Wheels. Once again, Broome keeps the junior partner’s world separate and distinct. He introduces high school teacher Linda Grant, who he will use in a later Kid Flash story, and keeps the action local with a story about less than scrupulous builders building a new school with shoddy materials. Hardly heavy duty superhero stuff, but pitch perfect for the Kid Flash story-telling universe. The Infantino/Giella art is pitch perfect as well. Again, this was still before my “time”, but with hindsight as my guide I can appreciate what those involved were building here.